So I wrote this admittedly brilliant little poem in a white heat on the train in to my summer job many years ago. It is one of the few poems that I only sent out once before it got published. Sometimes the magic just happens. I originally wrote it as a prose poem and that is how it was originally published. In the coming book it will appear as free verse. I like it better this way. There is more nuance with real line breaks. It is rare that I get chills reading something I wrote, but this one is special. I met her the day of her first crash. shades of grey, didn’t do her justice. away. At all altitudes she eluded capture. concentration, she parsed the spectrum for me. the chandelier of heaven. The crystal is blinding. Someday I will fly right through. I was not her navigator. I did not drink. silk white lessons of sky. But white had to wait. our wings jet branches gathering darkness in. whalecub learning to swallow sea. First you must finger gold. studded with citrine, topaz, blinking Midas tears. when the sleeves of her leather jacket rode up. She was never afraid of falling. wide. Wider. Fly right through. from above. But purple is imprecise. too slowly, she will break upon my invisible blades. asphalt arm reaching out to catch her. Shallow sea. Fair winds. Safe landing. lips of summer singing unspeakable endings. What does it mean, O my master? between desert and a full moon. Tongue falls silent. Music falls in sheets to the dunes, arpeggios of sand. of the stars you cannot fly to. Nothing. penumbra lightening in blinks of tired dark eyes. narrowing as I nodded and fought to wake. this vigil too, in the long tunnel toward morning. where gold and deep blue lie down together, fuse. without her, I am always flying right through. Spilecki, Susan. “Flying Lessons with Amelia,” Quarter After Eight 5. Fall 1998. 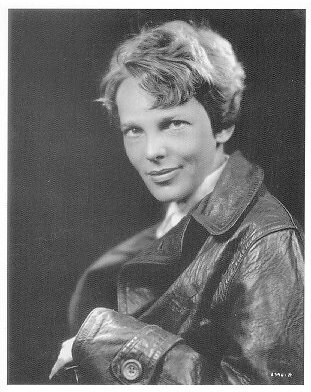 This entry was posted in free verse, inspiration, popular culture, prose poem and tagged Amelia Earhart, Electra, Quarter After Eight. I simply haffa reblog this. I won’t blather about how incredible it is…that much is obvious even to turtles who haven’t peaked out of their shells in a month!! i am a wreck, an absolute undone marvelling wreck. i am a heap of gratitude humbled into quiet awe. this is numinous and wondrous, and i blessed that in this life i read such a thing. here is one of my tears in this comment, like Lorien’s glimmer in Galadriel’s phial, and i give it to you here as my token.